Mike is a tattoo artist running his own shop, and Deb is the piercing artist he hires to round out the motley crew at his studio of four. The last thing either expects is romance, but that’s exactly what happens when they follow their off-kilter careers and love lives into complete and total disaster. When Mike follows a growing trend and tattoos the ashes of deceased loved ones into several customers’ tattoos, he has no idea that it will one day provide the solution—and solace—he will sorely need. And when the life of a serial killer tragically collides with the lives of those in the tattoo shop, Mike and Deb will stop at nothing in their quest for revenge, even if it means stepping outside the known boundaries of life and death. Ink that is full of crematory ashes, a sociopathic killer, and pain in its most raw form – this is going to hurt. It’s great to get to read the latest from the heavy hitters in crime fiction whilst doing this book blog, but sometimes it’s the new names. the fresh talent, that leads to the best surprises and the most exciting discoveries along the way. For me it happened with authors like John Rector and Ryan David Jahn, and it’s happened again here with Aric Davies. I found the central character of Mike and his motley crew of workers in his tattoo studio a really likeable bunch and connected with them immediately, despite the fact that they inhabit a world of which I know nothing. After a previous tragedy in his life, Deb comes along to give Mike’s life new purpose and then breaks his heart in one of the most traumatic events I have experienced in a book for a long time. I’d fallen in love with Deb along with Mike, which made the sudden darkness all the harder to bear. The theme of customers wanting something of their loved ones mixed in with their tattoos is at first a sickening thought but soon becomes something that you will accept as a great comfort to those left behind, providing them with ghosts of their beloved and Mike’s use of those ghosts to help trace a vicious serial killer is, as the title states, A good and useful hurt. For a novel that could easily have gone down the shlock horror route, it’s full of human compassion – I was particularly struck by the regular comment of how wrong it is that serial killer’s names are rarely forgotten and yet their victims pass and their names are rarely remembered, except in extreme cases of celebrity such as Sharon Tate. 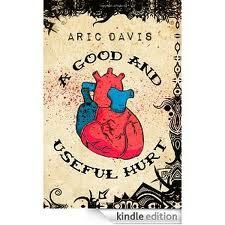 Aric Davies, a tattoo artist himself and a man who sat in fear in his own home whilst serial killer Rodrick Dantzler killed victims in his own street, has clearly put his all into this novel and I am very keen to read more of his work soon. Order your kindle copy here.